Casa costruita nel 1873, rinnovata nel 2006, elegante, spazioso e luminoso appartamento con 4 camere da letto su Zurichberg, 2 ° piano, 200 metri quadrati. Apt. ha pavimenti in legno originali, una stufa a legna, pianoforte, pieno di pezzi d'antiquariato. I 3 bagni moderni offrono 2 docce, 1 vasca da bagno, lavatrice / asciugatrice, 2 balconi privati ​​nella parte più bella di Zurigo, centrale a tutto ciò che Zurigo ha da offrire. In una delle più grandi camere da letto possiamo facilmente allestire un letto singolo per una festa totale di 9 adulti. Il quartiere di Hottingen è vicino a tutti gli ospedali universitari, all'università + ETH, al museo d'arte, al Bellevue, al teatro dell'opera, al lago di Zurigo, ai giardini botanici, alla foresta, ecc. Sempre disponibile: 1 camera da letto apt. con ingresso indipendente, bagno completo, balcone, cucina abitabile. Questo appartamento monolocale separato dispone di un letto king size, un balcone privato con vista sugli alberi, un'incantevole cucina abitabile con fornelli, forno, frigorifero, numerosi piatti, pentole, padelle, posate, scorte base di spezie, olii, ecc. lavatrice / asciugatrice, luminosa atmosfera allegra. Moderno bagno con cabina doccia, lavandino generoso, un'atmosfera luminosa troppo. Non avrete bisogno di una macchina mentre siete qui. Sei solo un treno, autobus, barca, bicicletta, funivia o tram di distanza da innumerevoli punti di interesse: gite alpine mozzafiato, tuffi nei laghi alpini, lungo le affollate strade di Zurigo sono centinaia di gallerie, ristoranti, caffè all'aperto, discoteche, discoteche e teatri; visita le rinomate sale da concerto di Zurigo, il teatro dell'opera, i giardini zoologici, i musei, gli eventi sportivi e culturali seguiti da cene a base di specialità svizzere. Fate un rapido passeggiata fino al vicino monte Uetliberg che domina tutta la città e il lago di Zurigo. Lei è anche una breve passeggiata fino al cristallino lungo 30 miglia Lago di Zurigo (che può anche essere cerchiato in bicicletta! ), O una breve corsa fino alla foresta e famoso 'onda' Dolder piscina o pista di pattinaggio per un cambiamento del tutto rinfrescante dal ritmo veloce. Bargain negozio lungo la Bahnhofstrasse di Zurigo, più esclusiva via dello shopping in Europa. Un elegante appartamento in una casa costruita nel 1873, pavimenti in legno di 120 anni, camere generosamente grandi, letto comodo con cuscini king-size, un balcone per due con fiori e piante, e un piccolo cortile al piano di sotto. L'ospite sarà diviso tra stare a casa o per esplorare le avventure culinarie e culturali di Zurigo ha da offrire. Zurigo è base di partenza per una vasta gamma di destinazioni. Due grandi aree sciistiche entro un'ora di viaggio sono Hoch Ybrig o Flumserberg. Per l'alta alpen sciistici contano 2 ore. viaggio. Siete tre ore da Verona via Milano e Monaco. La Foresta Nera in Germania, di Ginevra, l'austriaco, francese o confini italiani sono solo un viaggio lontano, treni generalmente lasciando una volta ogni ora. A soli 45 minuti dalla famosa città di Lucerna. A Zurigo si sono letteralmente situato nel cuore dell'Europa, ma può godere la vita cosmopolita i cittadini di Zurigo a cuore! Luglio - Agosto 2018: Luminoso, spazioso, elegante 4 camere da letto w / 3 bagni completi, stufa a legna. bar, min. prenota 2 settimane per il tuo soggiorno estivo a Zurigo. This apartment was amazing...spacious and comfortable. It has 2 bedrooms with a 3rd room with a murphy bed. The modern kitchen was a surprise and the living room has a balcony that overlooks a private courtyard. We stayed for 8 days and it was so nice coming "home" from a day of exploring Switzerland! The apartment is on a very quiet street and there are 2 metro stops within a 2 minute walk. We would definitely stay again. We spent 10 days here in September 2015. It was fabulous. 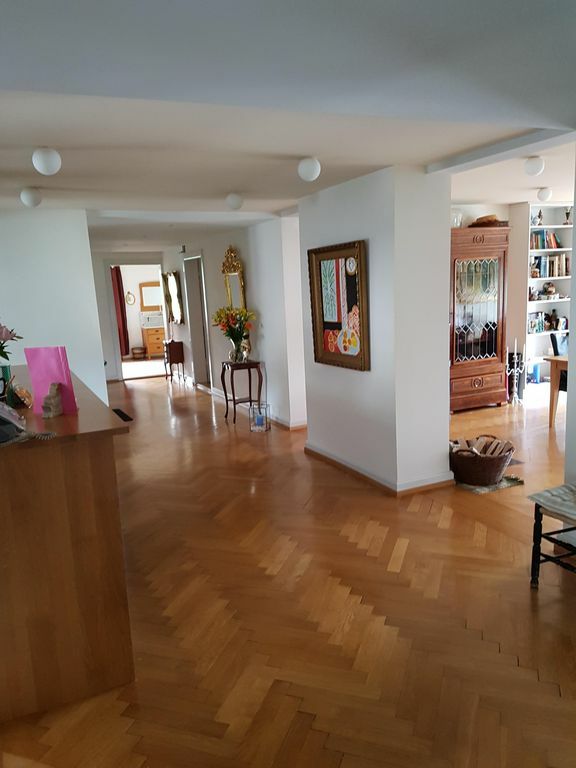 The location is excellent - a close walk to trams or the train - which take you everywhere you need to go -and/or a 15 minute walk to the old part of Zurich (with great restaurants), the lake, river, or the main shopping street. It is in a lovely residential neighbourhood, with grocery stories conveniently located nearby. Many of the main tourist sites, including the wonderful Kunstmuseum, are within walking distance. The apartment has everything you would need, including a well equipped kitchen and lovely deck off the large bedroom. Even the bed is really comfortable! The apartment has a lot of space for a one bedroom. We arrived at night, but there were breakfast fixings (eggs, croissants, milk) in the kitchen so we had something to eat the next morning, which was very thoughtful. The owners were very welcoming and helpful - a wonderful source of knowledge about Zurich and the surrounding countryside. All in all, you cannot go wrong with this property. You will not be disappointed! Steve and Crista were gracious hosts and met us at the train station to give us a ride back to the apartment. We enjoyed getting acquainted with them during our week stay. They made sure we had everything we needed and were helpful with ideas for exploring Zurich. We were there in July, and it was unusually warm for Zurich, but the apartment was always pleasant. The apartment was located in a very nice neighborhood of Zurich. It was also a short walk (a few blocks) to several tram stops with easy access to anywhere you would want to go. It was very close to the University area with many nice markets. Zurich is a beautiful city on a beautiful lake, and we would love to go back some day. This apartment and the owners made our month in Zurich exactly what we had hoped for. A great location is one thing, but the caring and assistance from the owners, when needed, and the superior equipped and appointed space, all rooms, were what the big difference. We felt at home the moment stepped into the apartment: A mix of antiques, personal touches, art work on the walls, a cozy outside balcony looking into trees and a courtyard, a roomy light filled kitchen, and connectivity via wifi that easily worked, are but some of the highlights here. I especially appreciate the well equipped kitchen. And, it was spotlessly clean. We hope to return more than once. We were comfortable and happy! We rather liked the walk up to second floor as it, and the daily waking in the city, replaced gym time. If raining or in a hurry, the trams, in either direction, are about 4 minutes away. All the services that we needed were close. Highly recommend this apartment. I wish I could've stayed longer! First, the owners are SO NICE! Not only were they VERY PERSONABLE and had everything written up in the apartment (how to get on internet, use TV, do laundry, etc. ), they did little things that made the place so welcoming and comforting, such as a nice vase full of fresh flowers. But they did not interfere either - great owners! Second, the location is awesome! 2 minute walk to the tram line that goes directly to the city center, or you can walk (walkable in 10-20 minutes, depending on where you want to go). It's also about 1 tram stop outside of the hustle and bustle of the downtown, so you really get the feel of a native. The apartment had all the modern luxuries one would expect and it was kept miraculously! Great art work, great flowers on the balcony, and great balcony. I couldn't have asked for a better situation! Our family of three, with a 14 year-old along, found this an ideal apartment for our 10 days in Zurich. It is all the things other reviewers noted. Especially so the cleanliness, quiet and comfort, spaciousness, and proximity to central Zurich. We would stay there again most definitely. Crista is friendly and as helpful as you need her to be (we were already familiar with the city). There are three flights of stairs. This was not a problem; just good to know. Our STANDARD RATE is for the 1-bedroom apartment with eat-in kitchen, modern bathroom with walk-in shower, private balcony, very large bedroom with King bed, desk, TV, wireless internet. This is ideal for a couple or a single traveler who enjoys the best location in Zurich for quiet and comfort. Accepting bookings for a min. of 1 week. Inquire today! For the period between July 19 - August 11th 2018 we offer entire, spacious 4-bedroom, 3 bathroom apt. with 2 balconies, modern kitchen and bathrooms, (see rates for prices) min. bookings 2 week for a party of max. 8, additional fee for party up to 9 people........ --- OR--- For the period between July 19th - August 11th we can offer the same apt. with just 3-bedrooms, 3 bathroom apartment as explained above. The 4th bedroom would be locked. See rates for the 3-bedroom rate.